In 1980, Mary Hodges who knew just about everybody in Borrowash and had a longstanding connection with St Stephen’s was asked to organise an exhibition for the centenary of her church. Thirty four years later, Mary found herself sitting at a table in Gordon Road, helping to plan commemorative activities for another milestone in the history of a village that has been her home for the past 52 years: the outbreak of the First World War. It was decided to organise two events: a formal Service of Remembrance at All Saint’s Church in Ockbrook on Sunday, 27th July and an evening of music, film and readings in the familiar setting of the Borrowash Methodist Hall. Members of the committee had a lively discussion about the programme, pressing the claims of various favourite poems and some contemporary prose extracts – and then Mary sprang a surprise. Rummaging around in her attic whilst searching for relevant family World War 1 memorabilia, she had come across the text of a poem given to me when I was organising the 100 year exhibition for St Stephen’s Church in Borrowash – but that was 34 years ago, so I cannot remember who gave it to me. Marion Johnson says in her book ‘More Memories of Ockbrook and Borrowash’ that it was written by a Mr. G Burridge ….. The Borrowash Boys cannot claim to be a great work of literature and nobody would dream of comparing its author with the likes of Siegfried Sassoon and Wilfred Owen. What it does do, however, is provide a fascinating snapshot of a Derbyshire community at the outbreak of the largest conflict in history to date, during the course of which over 15 million people were killed and large parts of Europe devastated. And then praise we sing aloud. We do not know whether or not any of the Borrowash Boys took the opportunity to strike the fear of God into the Kaiser; what is known is that for Tom Matchett and Archie Longden, a journey begun in a spirit of derring-do at a recruitment meeting in the Borrowash village schoolroom was to be of short duration. The Derby Daily Telegraph of 29th October 1915 announced their deaths in a brief obituary under the headline: Two Borrowash Boys Killed. Did the reporter attend the original recruitment meeting? Were the ‘boys’ given a financial incentive to enlist as The Surrey Advertiser tells us was the case in the parishes of Cranleigh and Ewhurst; home to National Reservist, Corporal Whitty who met his death in the same mine explosion as Tom and Archie? Corporal Whitty ..was very popular. He was one of the first to join the Queen’s in 1914 and he gave his £5 bounty under the National Reserve Scheme to the Prince of Wales’s Fund. (Surrey Advertiser, 30th October, 1915). 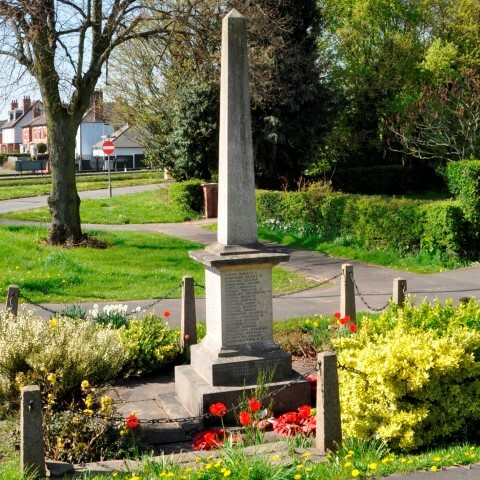 Tom Matchett and Archie Longden were two of the 19 ‘boys’ in the poem whose names now appear on the Ockbrook and Borrowash War Memorial, situated in Victoria Avenue. They did not come back home again and until Unexamined Lives uncovered the information, Tom Matchett’s nephew, (also called Tom), had no idea how his long lost Uncle had died. The Borrowash Boys and the names on the War Memorial have inspired us to search for the faces behind the names and the lives behind the inscriptions. but the centenary of the outbreak of the First World War has afforded the opportunity to make them live again on a page – and thus to honour their sacrifice. 19 boys mentioned by Burridge, died and their names are inscribed upon the War Memorial. 37 names from the poem are not and presumably they did return. Some of the deceased as might be expected, served in The Sherwood Foresters ( Notts and Derby Regiment) but others joined The Buffs ( East Kent Regiment), The Royal Army Medical Corps, The Grenadier Guards and even The Canadian Infantry. The group spanned rankings from Private to Second Lieutenant and they were aged from 18 (Sherwood Forester, Private John Kingham; son of Borrowash residents William and Charlotte) to 28 (Rifleman George Goddard who served in the Kings Royal Rifle Corps and was married to Sarah from 2 Mill Cottages, Station Road). What passing-bells for those who die as cattle? Wifred and Tom Matchett, Borrowash Boys casualties, were two of four sons born to Anna and Thomas from 12, Derby Road, Borrowash. In the 1911 Census. Thomas senior is described as: Labourer at the Colour Works, Megalaughton Lane, Spondon but a cycling accident and an ulcerated leg had confined him to home and garden by the time his grandson Tom was enjoying visits to the large double fronted house. The Matchett family home was close to Cotton’s Farm and Tom’s grandfather tended a good acre of land, growing vegetables and pruning his abundant fruit trees as well as keeping pigs and poultry. He was six feet something and Gran was five feet nothing but she was the boss. Gran held the purse strings. Whatever they had they shared and worked hard for – and they sacrificed three of their sons for their country. The youngest Matchett son, Tom’s father, Walter, was a casualty of World War Two, but the four eldest served their country in World War 1. Albert Matchett returned safely and was presented with the Military Medal in the Borrowash Methodist Chapel. Harold also survived his ordeal, and married Gladys Burridge – daughter of village poet, George. And do their parents good. Tom Matchett was a ‘hewer’ or miner who worked at the coal face. As Private G/3223 he was a member of the 7th Battalion of the Queen’s (Royal West Surrey) Regiment. The 7th Queens spent months in training at Codford in Wiltshire and on 27th July, 1915, boarded trains to Folkestone and sailed to Boulogne on the S.S. Victoria. Tom and his Company, the 178th, were involved in mining operations in the Fricourt area. Life was far superior to that of the infantry. We had shorter spells in the trenches; two days in the line and two or three days back at the headquarters in Meault. This meant that one worked really hard for a definite visible result in the line and had a real rest out of it; whereas the infantry’s duties were those of passive routine in the line and very tedious and continuous training while out of it. The men were inexperienced, but shells and trench mortars were not the danger. Any risk to the Company was due to a lackadaisical approach to duties from their French predecessors in the role who had very mistakenly begun mining without carrying out a vigorous policy; the Germans had replied with much more energy and effect, and by this time had got more than two-thirds of the way across No Man’s Land, here about 100 yards wide, with their galleries. Consequently, going underground involved some uncertainty as to the return journey. On 20th October, 1915, Corporal Edward Witty and others from his Battalion, were killed by the explosion of a German mine. He was just underground, preparing to go down the shaft, when an explosion occurred, and was killed instantly and painlessly by the shock and the rush of gas which followed. There is no man in my section of miners whom I could have missed more. Lt. Whitty’s body was subsequently recovered and buried in Norfolk Cemetery, Becordel-Becourt. The cemetery also contains the remains of six other members of the 7th Queens who died on the same day and presumably in the same accident, including Tom Matchett who has a marked grave. The deaths of two Borrowash boys at the front have to be recorded. They were killed by the explosion of a German mine. The chaplain has also sent a sympathetic letter to Matchett’s mother. Matchett’s brother, Wilfred, is also at the front. Less than a year later, the brother mentioned, Wilfred Matchett, Private15498, of 8th Battalion, Prince Albert’s (Somerset Light Infantry) Regiment died on 1st July 1916. Wilfred’s unit was part of the 63rd Brigade of the 21st Division. He was killed in the Battle of Albert on the first day of the Battle of the Somme; a day that will forever be remembered as recording the highest ever number of fatalities in British military history. On the 1st July alone, 20,000 British soldiers were killed and 25,000 wounded. The Battle of the Somme lasted for a four month stretch and cost the British army a further 95,675 soldiers’ lives. The young Tom went to live with his grandmother for company when Granddad died and helped around the place digging the huge garden with a spade and learning how to grow vegetables, prune fruit trees and rear poultry and rabbits. Because had I made any financial contribution to her, she would have forfeited one of her two supplementary pensions, paid for each of her sons lost in the war. Of them we’re very proud. As the war progressed, it is likely that such sentiments would have been replaced by feelings of corrosive anger and grief at the casual loss of so many young men on the threshold of life and promise. One such young man was Walter Day. Walter is not mentioned in The Borrowash Boys but his name is engraved upon the Ockbrook and Borrowash War Memorial. His wife, Frances Emily and son Raymond were living at the Noah’s Ark pub in Borrowash at the time of his death. Walter was the younger of Thomas and Lizzie Day’s two sons and was born in the summer of 1887 in Grendon, Warwickshire. His older brother, Thomas Francis was born in 1885 and their father was a farm labourer and waggoner who hailed from Gloucestershire. In 1884, Thomas married Lizzie from Derby and by 1901, the family had moved to Nottingham Road in Derby where Thomas took a job as a railway stableman. A railway stableman is to locomotives what an ostler is to horses, and locomotives, primarily used for transporting cargo, were predictably and appropriately known as ‘iron horses’. Thomas and other railway stableman were responsible for moving the trains between tracks and to repair facilities. They would have been authorised to move them within rail yards but not beyond. Walter, now 13 had left school and was finding his feet in a first job as a butcher’s errand boy. 1911 heralded further alteration in the family’s circumstances and the Days can be assumed to have gone up in the world. They had now relocated to the more affluent Ockbrook village and lived at Carr Hill Farm where Thomas Day who had left rail work behind, was described as a farmer and employer. Both Walter and his brother Thomas Francis, who had recently married Maggie, now worked on the family farm. Thomas, who was to join the South Staffs Regiment, appears to have been a Prisoner of War who was hospitalised at Glen Parva suffering from typhoid at the end of hostilities. Walter’s war service was shorter. On 12th August, 1916, Walter married Francis Emily. He had enlisted in Ilkeston in December 1915 and was mobilised into the 295th Siege Battery of the Royal Garrison Artillery in September 1916. At 28, he belonged to an earlier generation than the 17 and 18 year olds who signed up for army service at recruitment meetings like the one in the Borrowash school room – but he was a very new husband – and father! Raymond Sidney Thomas Day was born on 24th March 1917 and Walter arrived in Havre, France on 31st March after embarking from Southampton on March 30th. He may never have seen his week – old baby, because he would probably have been kicking his heels in the embarkation camp, ready to sail, when Raymond was born. On arrival in France, Walter’s Battery was assigned to the 2nd ANZAC Division. This was to prove its own baptism of fire because the Division was engaged in non-stop action throughout summer 1917 in the Battle of Messines and the disastrous Third Battle of Ypres, commonly known as Passchendaele. Passchendaele, situated on the last ridge east of Ypres was five miles from a railway junction at Roeselare which was a key part of the supply system of the German Fourth Army. The campaign concluded with the capture of Passchendaele by the Canadian Corps in November, but despite a successful eventual outcome, the Flanders initiative has remained mired in the bitter controversy it sparked at the time. Vitriolic complaints about the weather, the mud, and division between Allies and politicians about strategic objectives have certainly endured the passage of time – but time, for Walter Day, was to be in tragically short supply. The young husband and father was admitted to the 17th Casualty Clearing Station on 11th October 1917 and died there of wounds the following day. He had served at the front for just less than six months and is buried in Lijssenthock Military Cemetery near Ypres. Walter Day was posthumously awarded The British War Medal and the Victory Medal and his wife, Frances was assigned a war widow’s pension of 18 shillings and nine pence per week (about 97p in modern money). There are full service records for him and a list of personal effects, which were duly returned to Frances after his death. They include the ubiquitous pipes and tobacco pouch but also some personal items such as photographs, letters, a ring and a crucifix. Most poignant of this young man’s final effects is mention of toy cannon. We cannot know for certain why this was in his possession, but as an artilleryman, he had probably brought it for his tiny son whom he was never to see grow up. Raymond Day married Gertrude Gibson in 1940. Had he lived, Walter would have been a grandfather to Paul and Zena born in 1941 and 1945 respectively and then possibly, great grandfather in his eighties to Martin Gary (born 1966) and Hayley Sharon (born 1969), the children of Raymond’s daughter, Zena who married Brian White in Leicester in 1965. The likelihood is that he would have led a fulfilling and happy family life. A reading of The Borrowash Boys, might raise a smile because of the hyperbolic manner in which Burridge refers to the putative military careers of lads who would have been more accustomed to wield hoes than rifles. They were not professionals and a theory is that the disastrous WW1 reliance upon trench warfare was due to an unshakeable and mulish conviction of Haig and Kitchener that taking up position in a trench and then walking forward with a gun was the only feasible manoeuvre open to an untrained and largely civilian force. Yet individuals from the parish whose names are mentioned in the poem or inscribed on local Memorials acquitted themselves with credit. Edwin Moseley whose name is one of 24 on a Memorial in Borrowash Methodist Church, distinguished himself in operations at Hooge Crater, captured by the enemy on 30th July, largely courtesy of Commonwealth soldiers being taken unawares by some new German weapons. Flamethrowers emitted 32m long jet flames accompanied by thick black smoke and achieved the objective of securing the Crater, only to be thwarted by the British 6th Infantry Division’s re-capture of the Crater on the 9th August 1915. For conspicuous gallantry and resource on 9th August 1915, at Hooge, when he continually went across the open, repairing telephone wires under a very heavy shell fire, thus keeping up communication with his Company for the whole day. He displayed great coolness and bravery and was of the greatest assistance. was the son of Nathaniel senior and Julia of Victoria Avenue, Borrowash. A Lance Corporal in the Sherwood Foresters, he was to die aged just 21 on 20th July 1916, having justified Burridge’s high opinion by winning the Military Cross. His near neighbour was John Reginald Lilley Hunt, the son of popular local doctor John Aspinall Hunt and his wife Minnie Beatrice. Dr Hunt, who had practised from a surgery at Brookfield since about 1895, was born in Ockbrook, a member of the distinguished Hunt family of Bartlewood Lodge. In addition to his local practice, he was a surgeon, medical officer, public vaccinator and medical superintendent of the Draycott Isolation Hospital. He also served on the parish council. Burridge clearly approves. The other helps the mind. John Reginald Lilly Hunt, the third of John and Minnie’s five children, was born on 10th September 1896 and educated at Epsom College in Surrey. Queen Victoria became the first patron in 1855, beginning a tradition that subsequent monarchs have observed to the present day. The school has retained its strong links with medicine. By 1980, about 3,000 ex pupils had been helped to join the profession. It is likely that this is the choice of career envisaged by the Hunts for their son. 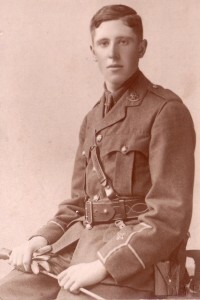 Like many boys educated at fee-paying boarding establishments, then as now, John joined the Officers’ Training Corps and followed suit during his degree course at University College, Reading. It is unlikely that in peacetime this would have presaged a military career, but the events of 1914 readjusted the life plans of most people. John Hunt joined the army on leaving university, was commissioned into the 2nd/5th Sherwood Forresters on 20thMarch, 1915 and went to France in January 1916. He was attached to the 139th Trench Mortar Battery on 29th April 1916. He lost his life just two months later on 1st July 1916, killed, as was Wilfred Matchett, on the first day of the Battle of the Somme. Six 3 inch mortars and their teams were scheduled to go in after the 4th wave on July 1st 1916 in support of 46th Division’s attack on Gommecourt. Two others were in Bastion trench and were detailed to fire on Little Z between 07.25 and 07.30. Both these guns were destroyed by German shellfire before they fired a shot. Of the six guns that went in after the 4th wave, No 1 reached the Germans wire but had only one man left and no ammunition, and No 2 gun was quickly put out of action in the advanced trench. Mortar no 3 and No 4 suffered similar fates, No 3 reached the German wire but without ammunition and No 4 didn’t get past the advanced trench. No 5 suffered damage from German artillery and did not advance past the front line trench and No 6 advanced about fifty yards when the men carrying the gun tube and base plate became casualties. One of the unfortunate officers was John Lilley Hunt, whose cousin, HH Lilley was simultaneously taken as a Prisoner of War. It is with much regret that I write you these few lines of condolence. I was servant to your son and was with him to the last and think it my duty to inform you of his sad but brilliant end. He was foremost in the attack and urging his men on when he was shot through the head, death being instantaneous. Our sympathies go out to you in your sad bereavement. I and the battery are proud to think we had such a good officer, he was loved and respected by all. With the hindsight of nearly a century, detail of this conflict tells a tragic story of a type of desperate bravery against a backdrop of strategic unpreparedness, typified by the repeated mention of no ammunition. We now know also, that many deaths at the front were described as instantaneous to spare loved ones the detail of long drawn-out and ghoulish suffering. For modern day readers, the First World War poets have filled that gap. At the time, it is likely that Dr and Mrs Hunt were glad to think of their son meeting his end swiftly and without pain and would not have wished to enquire further. John’s body was recovered in 1917 and buried in a temporary grave before being finally placed to rest in Gommecourt Wood, New Cemetery Foncquevillers. He was awarded the Victory and British Medals. Those colliers brave and strong. These particular ‘hewers’ were more fortunate than miner, Tom Matchett. One of their number, Elijah Highton, familiarly known as ‘Lidge’, was invalided out of action, met and married Mabel following a hospital stay and took her back to the village where they raised their children. Lidge joined the Labour Party, as did his son, Eric who became a local councillor and an active participant in parish activities. Other First World War recruits, commemorated on the parish Memorial met typically sad ends including Samuel Maurice Connor, son of a Moravian minister from the Settlement in Ockbrook, Ronald Charles Wilkins who died in Germany and had possibly been taken as a Prisoner of War and Archie and Thomas Longden who lost their lives as did their next door neighbours Lamech and Harry McConnell. A customary observation would be that the people commemorated in verse and on the various memorials in Derbyshire as elsewhere were invariably men – but this would not be true in the case of Ockbrook and Borrowash. The Victoria Avenue Memorial contains the names of brother and sister, Edwin and Margaret and their surname too is distinctive. (1771 – 1831), a composer and organist who was born at Sarepta, in southern Russia. He studied under a Moravian bishop and then taught music and foreign languages himself at Fulneck, the Moravian settlement near Leeds. Hasse composed and arranged largely sacred music and his son and grandson were respectively, a Moravian bishop and minister. Margaret’s father, Lewis St Aubin was born in 1853 in Ockbrook and it is likely that as a corollary of his profession, he lived with his wife Sarah and their children, Margaret, Gerard, Francis and Edwin in one of the houses in the Ockbrook Settlement. By the time of the 1911 census, Margaret who was born in 1887, is recorded as living at the Moravian Settlement in Fulneck, following in the footsteps of her great grandfather by working as a music teacher. I have recently taken a twenty-year pension from the R.C.M. Police ( Army service included) and I am leaving for London , England in about six weeks time. He begins his diary on 18th March 1916, describing his sojourn in France as comparatively uneventful until his arrival in Ypres Salient at that time. The troop spirit is good and the train journey from Poperinghe to Ypres is enlivened by singing the old and favourite choruses, a very mixed lot as usual – ‘If You Were the Only Girl, ‘There’s a Long, Long, Trail’ , ‘She Married a Man’ etc. A long march, through mud, shell holes and along broken trench mats, and everybody is more or less exhausted when the front line is reached early in the morning. The Hasse Diary is remarkable for the insight it provides into life at the front. The relationship between men and Officers is closely observed and free from caricature. He tells me it is his turn to ask a few questions – and he tells me not to hesitate in my replies. He then bombards me with about a dozen well-chosen questions, regarding Edmonton, Shorncliffe, the 49th etc – which, had I been a German spy, I certainly would not have been able to answer. He is satisfied and I proceed on my way, irritated by the questioning of the Sergeant. On duty at night at the signalling station in the Transport lines, George Young (Sgt) has some interesting yarns to tell of the West when he was a boy. Tells us how he once ran away from school and home, and hit the trail for Calgary and for several days rode on his pinto pony. Capt. Denning, an Imperial artillery Officer who has come up to the front line to try and do some personal observation, pays a visit to the cellar. A particularly fine type – he has our admiration for coming up to these Hooge trenches when he does not have to do so. What is more, he is not a young man. Where Denning really scores though, is in his readiness to share a great stock of racy yarns, collected in his travels all over the world, and he proves vastly entertaining. Gives us a good idea of what the Boer War was like, though naturally it was a picnic compared to this! Football match in the afternoon, between the Officers and the Sergeants. The Colonel, playing in goal, remarks that this is our great opportunity to get something of our own back. Fun, fast and furious. Every Officer, if he did not know his nick-name before the game started, certainly knew it before it ended. The Sergeants have known theirs for long enough. The Colonel gets shouts of ‘Attaboy Billy’ and cheers whenever he effects a save in goal. A habit I have of foot-tapping lets me in for a good rating from Capt. Pinder who is in charge of ‘C’ Coy. He hears the tapping and at once concludes that Fritz is undermining the cellar – until he notices that toe of my boot moving up and down! At other times, Hasse voices a more predicable resentment on behalf of ‘the poor bloody infantry’. Brigade sends up another message stressing the importance of securing a prisoner – we got a similar message yesterday. It is a pity Brigade cannot hear the reception these ‘messages’ get up here. Would give my next pay if Brigade could spend twenty four hours in these trenches, instead of in their comfortable quarters. Then: One German, an Officer in the lead, gets into our trenches, and he is badly wounded and is taken prisoner. The German prisoner is a good looking man and undoubtedly a most gallant Officer. He is first proffered a full glass of rum, at which he smiles, for he is too wise to have his tongue loosened in this manner, and it has to be much diluted with water before he even sips it. He proves reticent – as was expected. There is the prevalent sense that war is an enforced job on both sides and the fact that the German enemy is given a familiar nickname (Fritz) seems to strike a blow for normality in the midst of the most extraordinary circumstances. Miserable time in the trenches. No dug-out and no dry paper for the messages. Nothing hot to eat or drink , no wash or shave for six days, boots on all the time, no sleep except what could be snatched for an odd hour or so , wet and cold and lousy – but we have got used to the lice long ago. We have to crawl around like rats; and now the cellar is burnt the wounded have to lie around in the mud until the night before they can be taken out. Will be thankful when we can meet Fritz on an equal footing. Yet despite everything, the human spirit is remarkably resilient and every now and again, something crops up which raises a good laugh. Before retiring for the night, we make merry over what will probably happen in the small hours. Family members receiving the dreaded news of a death at the front were invariably informed that their nearest and dearest died ‘instantly’ and therefore suffered no pain. This kindness will just as often have asked the distressing truth about death in wartime. Low and I leave the dug out and find that Baldwin and Newport have both been badly hit in the head. The third man is dead, killed by concussion, for there is not a mark on him – he ran several steps down the trench and then back again before he dropped dead on the other two. I had been trying to tell him that he’d only got a good blightie. Newport is unconscious and Low and I bandage up his head as well as we can until a stretcher-bearer comes along with better equipment ( Newport died some weeks later in hospital). Low and I return to the signalling dug-out and Major Palmer puts his head in and gives a word of encouragement. Feel the loss of young Baldwin in particular for I happened to know him well. It was only the other night he was our dug-out, telling us of the leave he had spent in England. He dearly loved a good saddle-horse – he lived on the range – and he had spent part of his holidays riding over the Yorkshire moors, on a hired horse, in the neighbourhood of Settle, a district I know well. While Francis Hasse was riding a roller-coaster at the Front, his sister Margaret was undertaking a very different type of wartime service. She joined the Voluntary Aid Detachment as a nurse. The VAD was founded in 1909 with the assistance of the Red Cross and the Order of St John. Vera Brittain who wrote about her experiences as a VAD in Testament of Youth is a famous recruit. Initially, these untrained, largely middle and upper class women were distrusted by the professionals and their nursing contribution was restricted. As the war progressed, such scruples became redundant as of necessity and from 1914-1918, 38,000 VADs worked in hospitals and ministered to patients at the bedside as well as turning their hand to driving ambulances or working in the kitchens. The women served near the Western Front, and the Eastern Front as well as in Gallipoli and Mesopotamia. Most large towns in Britain also opened VAD hospitals and Margaret Hasse worked as a ‘Hospital Nurse VAD’ at the Royal Victoria Hospital. The Royal Victoria in Netley was a Military Hospital built in 1855 on the specific instructions of Queen Victoria in order to treat men who had been wounded in the Crimean War. It was situated on the shores of Southampton Water and in 1900 a railway line was constructed and patients arrived by ambulance trains direct from Southampton docks. During the First World War, over 50,000 patients were treated at Netley and its original capacity was extended by 2,000 beds when a large Red Cross hospital was built in the fields behind the main building. The majority of staff were Red Cross VAD nurses like Margaret. Margaret Hasse may have joined the VAD before the outbreak of war. A Voluntary Aid Detachment was formed in Ockbrook and Borrowash in 1910, the first Women’s Detachment in Derbyshire. The work of such an organisation in peace time is to prepare itself for wartime, accordingly the twenty members, with their Officers-Commandant, Lady Superintendent and Quartermaster – went through drills, attended first aid and nursing lectures, took part in field days, consisting of rapidly preparing any given place for the reception of wounded soldiers. From time to time, the Detachment was inspected by the proper authorities. In December 1914, the Moravian Lecture Hall and Sunday school in Ockbrook were taken over by the Voluntary Aid Detachment and converted into a twenty bed hospital. Margaret Hasse worked at Netley, but was professionally attached to her local VAD and completed her preparatory training under its aegis. In a Derby Daily Telegraph article dated 9th September 1915, she is mentioned in the company of other nurses presented with their St. John’s Ambulance Association first-aid certificates. A largely attended meeting of the Ockbrook and Borrowash branch of the Red Cross Society was held in the National Schools, Borrowash on Friday evening under the presidency of Mr. J. Birkinshaw. Amongst those supporting the chairman were the Rev Chas. Prodgers ( vicar of Elvaston), Dr. J.A. Hunt, Col. Brooke-Taylor ( Bakewell), Mrs Parry ( secretary). All the members of the local Voluntary Aid Detachment were present in uniform and several wounded soldiers from the Ockbrook Hospital, accompanied by the sister-in-charge. The Chairman briefly reviewed the work of the nurses in glowing terms and also the excellent work of Dr. Hunt as medical officer and instructor. The address was given by vicar Prodgers and described as capital by the admiring reporter. Margaret received her first aid certificate and also a St Johns ‘nursing’ certificate. Unlike her brother, Francis, she has not left a diary covering her work during those years, but The Moravian Messenger article give a flavour of life on the local wards for patients and nurses. The nurses come on in three shifts a day, morning, afternoon and evening and have a week on and a week off. With the exception of four, all have passed their H.N. and F.A exams, and a great number possess Red Cross proficiency badges and bars, and St John Medallions and labels, also Red Cross Associates and Members’ service badges. Five nurses are serving in military hospitals in Rouen, Netley, (presumably Margaret) Portsmouth, Glasgow and one is on her way to Egypt. The patients have hospital duties and thus lighten the work of the nurses; when these are done they are at liberty to walk, golf, play bowls, cricket and football in season, or go to the recreation room in the Girls’ School, kindly lent by the Headmistress, and play billiards and bagatelle; they can also get passes to Derby any day of the week within certain hours. The evening is always made as attractive as possible by providing them with games, music, whist drives and concerts, and those who wish to improve themselves in shorthand or French have the opportunity of doing go. Bishop Ellis is most kind in responding to every invitation to recite to the men, and greatly do they appreciate his own war verses. The efficacy of the Bishop’s homespun poetry as a healing agent may be queried, but he was clearly glad of a captive audience and the men were doubtless too polite to resist! However, the work of the hospital was properly appreciated by its patients. That patients are benefitted in body and soul by the kindness and sympathy shown to them all round while in Ockbrook is manifest by the grateful letters they write to nurses and friends in the village. This gratitude has also been shown on one of the occasions by gifts of money and presents to the hospital. Some men have shown – and this is a gift which all who have anything to do with the patients prize the most – that the influence of the Sister and nurses has been such as to enable them to go back to the trenches strengthened in the inner man. In 1916, the Moravian Church in Ockbrook was the venue for a special service to mark the second anniversary of the outbreak of war. The Derby Daily Telegraph covered the service in its edition of 10th August 1916 and the article describes a packed congregation; its numbers swelled by nurses and wounded soldiers from the local hospital. The Reverend S.A. Kershaw presided over the proceedings and the address was given by Rev. L. St. A. Hasse. Whose son, Lance-corporal E.R. Hasse was killed in action on July 12th. The service was very impressive, and concluded with the Benediction and the National Anthem. On 25th October, 1918, a Derby Daily Telegraph journalist returned to the church at Ockbrook to mark a sad event; the funeral of Margaret Hasse. Her brother, Edwin was a casualty of war; Margaret was to succumb to the influenza pandemic of 1918 -1919. Known as ‘La Grippe’ or ‘Spanish ‘flu’ it killed more people world wide than the war itself and was most deadly for people aged 20 to 40 – a group that included Margaret. The 1918 has gone: a year momentous as the termination of the most cruel war in the annals of the human race; a year which marked , the end at least for a time, of man’s destruction of man; unfortunately a year in which developed a most fatal infectious disease casing the death of hundreds of thousands of human beings. Medical science for four and one-half years devoted itself to putting men on the firing line and keeping them there. Now it must turn with its whole might to combating the greatest enemy of all – infectious disease. As told by The Derby Daily Telegraph, Margaret Hasse’s funeral is a sad affair. Her death, on the 16th October, 1918 was sudden, after a brief illness of only two days. There is widespread sympathy for the family in their unexpected bereavement and Margaret’s parents are accompanied by her brother, Gerard from Edinburgh. The newspaper gives a brief account of Margaret’s career at Netley, including the fact that she had recently been awarded the Red War Service Bar on the recommendation of the Netley hospital matron. Her coffin was draped with the Union Jack and a military bugler attended from Derby to sound the ‘Last Post’ at the graveside. Margaret was honoured by the presence of nursing comrades from Ockbrook and Netley and a large number of floral tributes. Nurse Hasse was 31 years of age. And what do we know of George Burridge, author of The Borrowash Boys? His literary abilities rank him firmly alongside Bishop Ellis of Derby rather than Wilfred Owen and Siegfried Sassoon; but his pride in the intrepid youth of Borrowash at the outbreak of war cannot be questioned. Burridge was not a native of the village; hailing as he did from Wootton in Bedfordshire where he was born in 1860. In the 1880s he moved with his wife, Emma, to Ockbrook Lane oin Borrowash where he is registered in the 1891 census. In 1891, he was described as a factory drayman; in 1901 as a boilermaker’s labourer and in 1911, as a gardener nurseryman. His home was in Victoria Avenue as it is now known. George and Mabel had five children, George (who may have emigrated to Canada), Elizabeth, Louisa, Albert and Gladys. Here, Burridge’s life interweaves with that of the Matchett family because Gladys, (who died in 1965), married younger son and war survivor, Harold, the uncle of Tom who had lived with his grandmother after the death of her husband and the loss of her eldest sons in World War One. We do not know if The Borrowash Boys is his only poem – or if, like the Bishop, he was accustomed to trying out other creative efforts upon friends and family. What his work has achieved is to bring to life a period of Borrowash history as faded as the worn names on church grave stones – or inscriptions on a War Memorial. The War Memorial for the parish was marked by a service of dedication in Ockbrook church. The event, as may be predicted, was covered by The Derby Daily Telegraph in its edition of 25th October 1920. The Rev J.P. Hales (hon. Chaplain to the forces) vicar of Cotgrove, Notts, officiated, assisted by the vicar of Ockbrook, Rev. D. Hassler. There was, he said, only one standard of service for a man and that was whether he did, or did not, what he felt he ought to do when he had the opportunity. The local paper, too, had performed its function, faithfully and well, recording a particular time in the life of a community – and attempting to make sense of it for the people who lived there. That was then, and remains now – the function and purpose of journalism and there cannot be a better one. But it is also the function of literature – both read, written and spoken and as someone who has spent their entire life doing all three, with varying degrees of success, I prefer to end with the muse. He will think he’s struck a mine. I would like to thank Keith Oseman and Peter Ball for the World War One research; Tom Matchett for his memories of uncles and family; Margaret Barker for access to The Moravian Magazine and Mary Hodges for unearthing The Borrowash Boys. Helen Clark would like to thank Anthony Heron and Paul Hart for the individual interviews and Keith Oseman and others for the subsequent transcription. Some of the Lives are based solely upon personal diaries and other written material. Click the image above to search the names of the men and women of Borrowash and Ockbrook who died in World War One and whose names appear on the three War Memorials in the village. Oh Mandy! – Amanda Solloway M.P.